Stairwell’s interviews San Francisco visual artist Dana Hemenway on her experience creating unique moving stair sculptures for her collaborative performance piece HVAC: Thermal Comfort. Hemenway shares how she developed the sculptures in relation to the HVAC theme, the process of integrating them with movement and dance, and her favorite Bay Area stairs. How did you decide to work with stairs for HVAC? I was interested in using the sculptures to frame and better see the HVAC (Heating, Ventilation and Air Conditioning) system at CounterPulse. Theirs, like most HVAC systems, is mostly in the ceiling, so I wanted the sculptures to provide access up to the vents and ducts above our heads. Stairs seemed like a great way to do that. I was also interested in the metaphorical implications of stairs and their relationship to hierarchy—who globally benefits from HVAC and who suffers from it, now and in the future, due to its impact on global warming. One alarming fact I came across in research is that the amount of energy used for air conditioning in the U.S. is equivalent to all of the energy used in the entire content of Africa. Did the choreography for the piece come first and lead to building the stairs, or did the stairs inform the choreography? Mostly the structures came first and the choreography second, but we did have a few rehearsals without the sculptures (while they were being made). 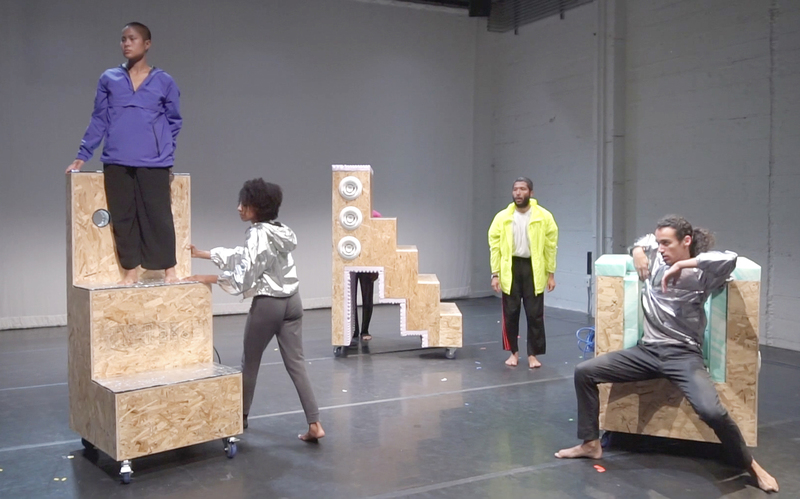 We used chairs and benches as stand-ins, and that gave me a lot of confidence in the dancers’ ability to do interesting and surprising things with basically anything. 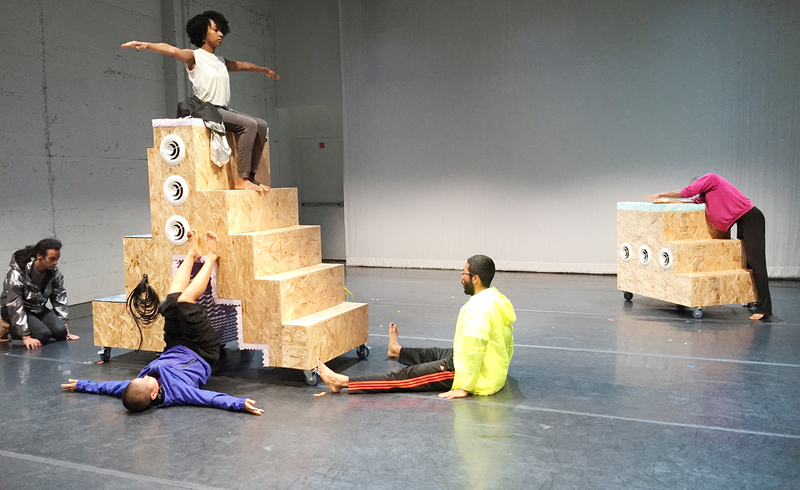 How did the dancers react to performing on moving stairs? They all reacted really differently. Each person thought of their own unique ways of interacting with them, and also had their own comfort level about how much they wanted to push what they could do on them in terms of risk, acrobatics, or aerobics. Sometimes the smaller gestures were just as powerful as the more acrobatic ones! How did you arrive at the rise/run* dimensions you used? Did you do any stair standards research? Weirdly, I did not do any research on stair standards! 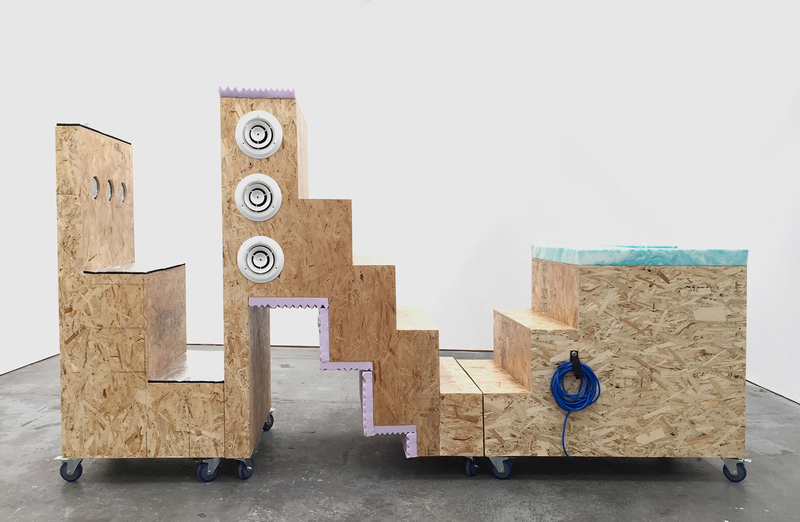 Two of the sculptures incorporate more conventionally-scaled stair elements. To set the run for these steps I started out by looking at the size of my own foot and figured that some people’s feet might be bigger, so I added a few inches. But then I had to make all the sculptures smaller to fit in the elevator at CounterPulse for storage, so I decreased the run of each step a bit. I tried to think about how much surface one would need to comfortably move on (one sculpture ended up with a run of 8” and the other, 9”). I set the rise at 12” since I figured it was a comfortable height to raise your foot and I liked the way it looked. For the third sculpture, which has more exaggerated steps, I wanted to create a more sturdy platform that a dancer could move around and stand on. I made the run of these steps a fair amount deeper at 14” and 11”, and increased the rise to 14” and 20”. * ‘Rise’ and ‘run’ refer to the vertical and horizontal dimensions of stairs. Building standards have evolved over time, but the current rule in the U.S. is “7-11”, meaning a 7” rise and an 11” run. Consistent rise and run dimensions help keep stairs safe to use, as our bodies quickly acclimate to a particular height and depth when climbing stairs. What was the best aspect of working with stairs? The best aspect is how surprisingly tall you get when you stand at the top of the tallest set of stairs. While they were in my studio, I actually used them to get something down from the ceiling! Do you have any favorite stairs you’d like to share with Stairwell’s fans? I just started teaching at UC Berkeley and the stairs in Kroeber Hall* are amazing. The building is pretty utilitarian/bureaucratic in its aesthetics but the stairs have an ostentatious art deco gold leaf ceiling, a black steel railing, and the bottom of the stairs are painted a rust orange/red. I think they must also have particularly good acoustics since I have heard people singing in them and it sounds amazing! * An early Stairwell’s Field Trip back in September 2012 included a stop at Kroeber Hall, where the a capella group Spot the Octopus led us in a raucous noise making session at the base of the stairwell. Read more here. Will stairs continue to be a part of your work in the future? I might have caught the bug! I am loving stairs right now and would certainly keep working with them if ideas or opportunities arise.